MGI offers full plastic card solutions with the PressCard Pro & PunchCard pro. This compact pair will allow your customers to laminate and die cut short runs of plastic substrates such as PVC, Polycarbonate, Vinyl, and Synthetic Papers. Our plastic card solutions create new opportunities in Plastic Cards, RFID Cards, ID Cards, Business Cards, Outdoor Signage, POP and more! The JETcard 3D provides an all-inclusive printing/encoding/finishing solution for plastic card production. 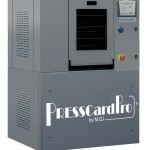 The PressCard Pro is an industrial production unit dedicated to short run lamination of plastic substrates. The PunchCard Pro makes plastic card finishing easy and affordable. Plastic card production solutions can add to your bottom line. For the first time in the plastic card segment, a digital device can go head-to-head with offset in terms of run length, color capabilities, and speed (up to 8,000 cards per hour), while maintaining a cost below industry standards, even on the shortest runs. 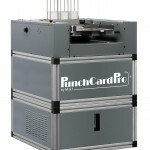 The PunchCard Pro is a standalone, hydraulic finishing unit for paper or plastic cards. The PunchCard Pro is a semi-automatic card punching unit capable of punching 6,000 ISO CR-80 plastic cards per hour in layouts ranging from either 21 or 24 cards up. 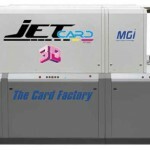 MGI’s JETcard 3D is a true card factory and can replace up to 5 different pieces of equipment traditionally used in the plastic card production chain: litho press, lamination press, die cutter and encoder/personalization printer. Click here for more information on the JETcard 3D. The PressCard Pro is an industrial lamination unit for paper and plastic substrates, including PVC, polycarbonate, vinyl and synthetic papers. The unique technologies integrated into the unit include individual heating, cooling and pressure control circuits. For additional information on MGI’s plastic card solutions, visit us online at www.midstatelitho.net or give us a call at 810-238-7370. This entry was posted in Vendor News and tagged GOA, MGI, Plastic Card Production on February 12, 2015 by MSL.